After Irl Tubbs resigned following the 1936 season to become head coach at Iowa, Jack Harding was hired to serve as both head football coach and athletic director at Miami. In 1937, the Hurricanes moved into the brand new Burdine Municipal Stadium (renamed the Orange Bowl in 1959), located west of downtown Miami. The following year, Miami played archrival Florida for the first time, defeating the Gators 19–7 at Florida Field, and won the program's first Southern Intercollegiate Athletic Association title with an 8–2 record. The Hurricanes, though, left the SIAA just three years later, becoming an independent once again. Harding led the Hurricanes to eight- and seven- win campaigns in 1941 and 1942, respectively, before he was called away by World War II service. Eddie Dunn, a former star running back at Miami under Harding, stepped into the void and served as head coach during Harding's two-year war service. Though the Hurricanes won five games in 1943, they faltered in 1944, winning just one game against seven losses and a tie. Fortunes changed with Harding's return in 1945, as the Hurricanes went 9–1–1 and returned to the Orange Bowl for the first time since 1934, defeating Holy Cross 13–6 in a memorable game. With the score tied 6–6 and only seconds remaining, Holy Cross quarterback Gene DeFilippo was intercepted by Miami's Al Hudson at the 11-yard line. Hudson dashed 89 yards the other way for the game-winning touchdown as time expired. Harding's Hurricanes won eight games in 1946, but after the team slipped to 2–7–1 in 1947, he resigned as head coach, but continued as athletic director. He hired Andy Gustafson as the new head coach, closing out a nine-year tenure in which Miami went 54–29–3 and won at least 8 games in four different seasons. On December 20, 1970, Fran Curci, a former All-American quarterback for the Hurricanes under Andy Gustafson, was named as the program's new head coach. Curci's 1971 team improved by a game, but rival Florida Gators defeated Miami in a game that came to be known as "the Florida Flop." With Florida leading 45–8 late in the fourth quarter, the Gator defense allowed Miami to score so that Florida would get the ball back and quarterback John Reaves would have the opportunity to gain the 15 yards he needed to break the NCAA record for career passing yards. 1972 brought another memorable finish for Miami, when the inadvertent gift of a "fifth down" by officials enabled the Hurricanes to edge Tulane in the waning moments of the game for a 24–21 win. Curci left the program at the conclusion of the season and was replaced by Pete Elliot. Elliot, in turn, lasted two seasons and stepped down in 1975 to become Miami's athletic director. Offensive coordinator Carl Selmer was named the program's fifth head coach in six years. Under Selmer, a trend that started earlier in the decade continued, with home attendance declining every year. After finishing 2–8 in 1975 and 3–8 in 1976, the university fired Selmer, citing concerns about dwindling attendance and the loss of local blue-chip recruits to other schools. After a national search, Lou Saban, formerly head coach of the NFL's Buffalo Bills, Denver Broncos, and Boston Patriots, was hired on December 27, 1976, as head coach. Miami only won three games in 1977, but Saban was able to put together a well-regarded recruiting class that included future Pro Football Hall of Fame quarterback Jim Kelly of East Brady, Pennsylvania. Kelly had been recruited by Penn State as a linebacker and agreed to come to Miami after Saban promised him he would play quarterback. Among the other 30 signees in Saban's first recruiting class were 11 future NFL players. The Hurricanes improved by three games in Saban's second season and Ottis Anderson emerged as an NFL talent. Anderson became the first Miami running back to rush for 1,000 yards in a season and led the team in rushing for three straight seasons from 1977 through 1979. Anderson set numerous school rushing records and was Miami's career rushing leader until 2014, when he was overtaken by Duke Johnson. After just two seasons as head coach, Saban resigned in the wake of a controversy concerning football players throwing a Jewish man into Lake Osceola, an on campus lake. He left after the 1978 season to take the head coaching position at Army. The following two seasons yielded less success. In 1993, the Hurricanes lost three games in a season for the first time since 1984, failed to win the Big East for the first time since joining in 1991, and was shut out in the Fiesta Bowl by Arizona, leading some to wonder whether the program was in decline. In 1994, Miami defeated Georgia Southern in the season opener for its 58th consecutive home win, setting an NCAA record. The streak, which began in 1985, was snapped two weeks later when Washington defeated the Hurricanes 38–20 at the Orange Bowl. Led by All-American defensive tackle Warren Sapp and sophomore linebacker Ray Lewis, the team rebounded to earn a berth in the 1995 Orange Bowl, where No. 1 Nebraska outscored Miami 15–0 in the final quarter to win the game, 24–17, and the national championship. With the threat of NCAA sanctions hovering over the program for a variety of infractions, Erickson stepped down after the 1994 season to become head coach of the NFL's Seattle Seahawks. Erickson departed Miami with a 63–9 record over six seasons and the highest winning percentage (.875) and most national championships (2) of any coach in school history. ^ Joey Johnston (December 31, 2008). "Drama-Filled Marve Saga at UM Comes to End'". Tampa Tribune. Archived from the original on February 3, 2013. Retrieved Dec 31, 2008. ^ Miller Degnan, Susan (September 10, 2009). "ESPN viewers flocked to Miami Hurricanes–FSU matchup". The Miami Herald. Retrieved September 12, 2009. ^ Jackson, Barry (Dec 1, 2009). "University of Miami resists ESPN film, but will show it". Miami Herald. Retrieved December 4, 2009. The 1941 Miami Hurricanes football team represented the University of Miami for the 1941 college football season. The Hurricanes played their nine home games at Burdine Stadium in Miami, Florida. The team was led by fifth-year head coach Jack Harding and finished with an 8–2 record, unranked in the AP poll. The Florida game was played on Saturday night, the rest were on Friday nights. The 1947 Miami Hurricanes football team was an American football team that represented the University of Miami as an independent during the 1947 college football season. 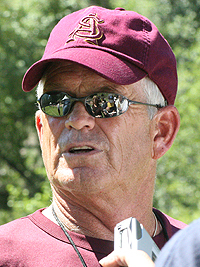 In its ninth and final season under head coach Jack Harding, the team compiled a 2–7–1 record and was outscored by a total of 140 to 80. The team played its home games at Burdine Stadium in Miami. The 1956 Miami Hurricanes football team represented the University of Miami for the 1956 NCAA University Division football season. The Hurricanes played their home games at the Burdine Stadium in Miami, Florida. The team was coached by Andy Gustafson, in his ninth year as head coach for the Hurricanes. The 1959 Miami Hurricanes football team represented the University of Miami for the 1959 college football season. The Hurricanes played their home games at the Miami Orange Bowl in Miami, Florida. The team was coached by Andy Gustafson, in his twelfth year as head coach for the Hurricanes. The 1965 Miami Hurricanes football team represented the University of Miami for the 1965 college football season. The Hurricanes played their home games at the Miami Orange Bowl in Miami, Florida. The team was coached by Charlie Tate, in his second year as head coach for the Hurricanes. The 1968 Miami Hurricanes football team represented the University of Miami for the 1968 college football season. The Hurricanes played their home games at the Miami Orange Bowl in Miami, Florida. The team was coached by Charlie Tate, in his fifth year as head coach for the Hurricanes. The 1995 Miami Hurricanes football team represented the University of Miami during the 1995 NCAA Division I FBS football season. It was the Hurricanes' 70th season of football and 5th as a member of the Big East Conference. The Hurricanes were led by first-year head coach Butch Davis and played their home games at the Orange Bowl. They finished the season 8–3 overall and 6–1 in the Big East to finish as conference co-champion. They served a one-year bowl ban due to NCAA sanctions that were levied at the end of the season. The 2003 Miami Hurricanes football team represented the University of Miami during the 2003 NCAA Division I FBS football season. It was the Hurricanes' 78th season of football and 13th as a member of the Big East Conference. 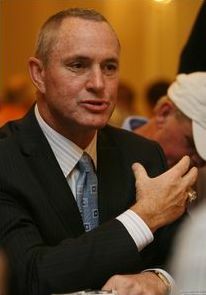 The Hurricanes were led by third-year head coach Larry Coker and played their home games at the Orange Bowl. They finished the season 11–2 overall and 6–1 in the Big East to finish as conference co-champion. They were invited to the Orange Bowl where they defeated Florida State, 16-14. The 2016 Miami Hurricanes football team represented the University of Miami during the 2016 NCAA Division I FBS football season. It was the Hurricanes' 91st season of football and 13th as a member of the Atlantic Coast Conference. The Hurricanes were led by first-year head coach Mark Richt and played their home games at Hard Rock Stadium. They finished the season 9–4 overall and 5–3 in the ACC to finish in a three-way tie for second place in the Coastal Division. They were invited to the Russell Athletic Bowl where they defeated West Virginia, 31-14.